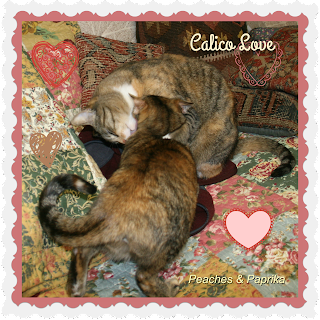 Whereas my sisfur Peaches in her usual, um, overly flamboyant style has selected a card with 'FLASHING HEARTS" We couldn't decide what to do so are posting both to with you a double or quadruple valentines day! We like both cards, girls. Happy Valentine's Day! They are both lovely. Wishing you a very Happy Valentine's Day! Happy Valentine's day a day late. Glad you like Little Bit. She is a very cute cat.We would be glad for you to put her on your Orange Cat day but please remind us so we don't miss it. You all have a great day. Aww ... we love both your cards! We hope you had a lovely Valentine's Day!